The easiest Valentine’s treat you can make! 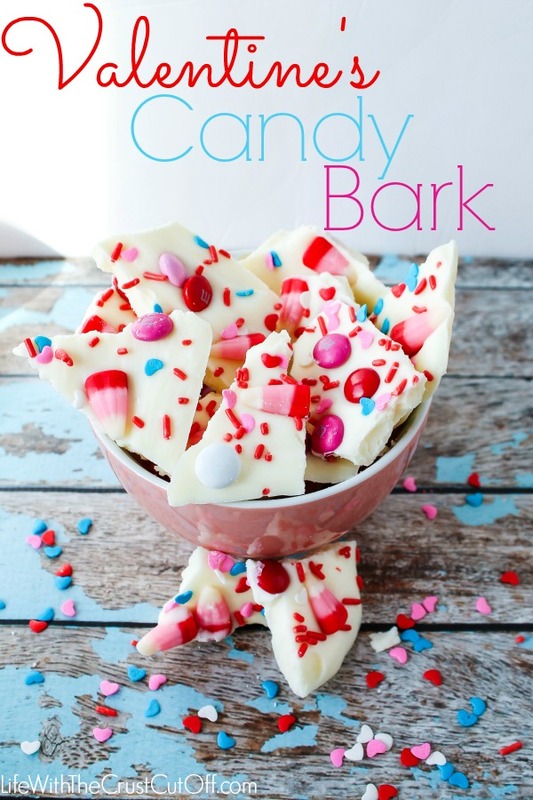 This Valentine’s Candy Bark makes a perfect treat to make and give! The white chocolate with the sprinkle colours is so pretty. Thanks for sharing at Simple Supper Tuesday. Love that these are easy enough for the kids to help with! Super sweet! Fun! My kids would love to make this. So perfect for Valentine’s Day! These turned out SO cute!! Gotta love the Target One Spot sprinkles — just picked up some myself this past weekend. Thanks for the inspiration! YUM! Looks fun, easy, and tasty! This is so pretty! My boys would have a blast making this. Thanks for sharing. I know my fiance would love this! He’s going to be away from home for Valentine’s, so this could make a nice gift for him to take along! Pinning! Wow, this is just so cute Parrish! And so is you little boy! I love the color of the candy against the white. Good job, and I followed you to see more of your work in the future. Thank you for linking up your wonderful recipes to our round-up this week. I’m headed to the store tomorrow to grab everything to make this, my kids will LOVE it!. Love the contrast in colors! We do festive colors for all the holidays. One year I was able to find some shamrock shaped sprinkles and we did an almond bark for March. Stopping by from the SITS girls link party! This looks delicious and so easy to make! I love it! I totally support your little dude’s getting carried away with his bark toppings–bring on the sprinkles! I love bark in any form and I love all the Valentine’s candy. I had no idea candy corn existed in February! My girls love to help out, especially when it involves candy. Your pics are great, makes me hungry ;) Thanks for joining the Mixer last week. Hope to see you again tomorrow. The Valentine bark looks too pretty to eat! But, of course, I would! Definitely going to make this next month! This looks so fun! Pinning to the Monday Funday board! Thanks for linking! Yum! Thanks for sharing on Found & Foraged! Love how festive this Valentine’s bark is! And how cute is Dean with those toppings?! Hi Parrish! Just wanted to let you know, we are featuring your post on Found & Foraged tonight! These were great!! So easy to make!!! I made them with m&ms, candy corn, pretzels and jimmies. They were so good. My husband and son couldn’t stop eating it. I made them for my daughter and other midshipman at the US Merchant Marine Academy. I hope they love them as much as we do. Thanks for the recipe.